Over the last couple of years I’ve seen several of these 16” Wooden Bandsaws here on LJ’s based on Matthias Wandel’s plans. About a year and a half ago, I started building my own… it took about 6 months to finish a little at a time, and then another year to finally paint it. Well last night I finally finished painting and putting it back together and can finally post my completed bandsaw. This is fantastic! Nice job! Nothing better than using a tool you have built! Looks great! That’s a hellofa project. Well done. Thanks for the feedback! It is fun every time I go to use it and remember that I actually built it! How much would you say this cost if you had to put a ballpark on it. I would love to build one since I don’t have a bandsaw, but not if it’s going to cost me nigh what a manufactured one would. Looks good, but in the time it took you to build this, I completed 8 projects with my store purchased bandsaw. Sorry, it gives you a good feeling but I just don’t see its practicallity. ohwoodeye – I hear you, this started as more of a “can I do it” and fun project than practical one. My shop time about relaxing and enjoying my hobby… not so much productivity. All I can say is WOW!!!!!! Must be a fun build! Enjoy your home made band saw. 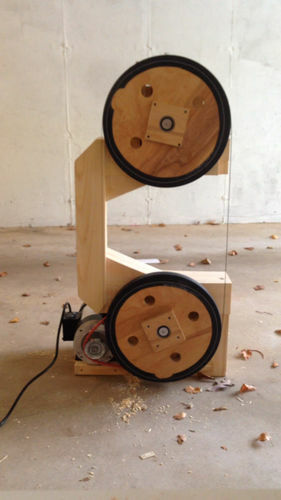 Another quality Matthias bandsaw build. I plan on building one sometime in the not-too-distant future. Did you make your measurements in metric or SAE? I know the plans come in metric, but all of my tools are calibrated for SAE. If you used inches, was it hard to convert? Just wondering which way I should go. I have a metric tape measure, but besides that it’s all inches for me. You can get plans converted to imperial units. I actually just worked in the metric units that the plans came in. SketchUp will convert everything for you by just changing one setting but it was just easier to work in the units it was designed in. I’m in Connecticut, so I use imperial units here… it took some getting used to but I saw the genius behind the metric system after a while. Especially in an engineering/mechanical implementation like this project. I’d really like to build one of these. I’ll be getting the plans shortly. I’ve got a few questions. 1: Approximately how many board ft does it take? 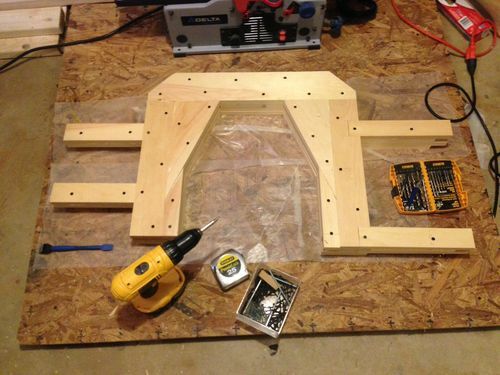 2: I notices that you placed several screws in the frame from the rear, is this per Woodgears design? 3: How easy was it to allign? -- For what does it profit a man to gain the whole world and forfeit his soul? 2. The screws were only there because I didn’t have enough clamps to clamp an entire layer of the frame at once. So I clamped and then screwed about half of the layer at a time, and then moved the clamps to the other half of the layer. The most important thing about this method is to remove the screws before you add a second layer. You’ll need to drill through the frame at a few points and really don’t want to hit one of these screws! 3. You really need to pay attention to the alignment throughout the whole build. My advice is to keep checking the frame for squareness at each layer of the frame. 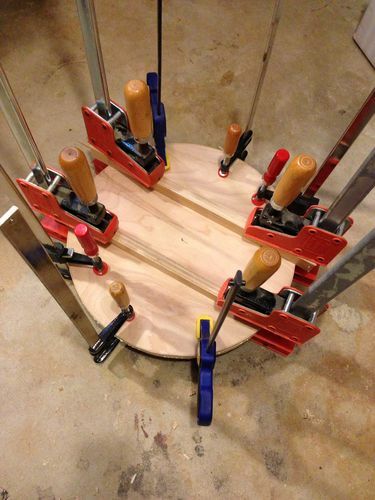 Then when the whole frame is glued up, check closely for any twisting before you even think about mounting the wheels. If your frame is properly aligned the wheels will be easy. Excellent build! I could never make my own band saw.